Norman H. Rappaport, MD, FACS is among the first plastic surgeons to offer Crisalix VR 4D consultations. Norman H. Rappaport, MD, FACS at Houston Center for Plastic Surgery is among the first plastic surgeons around the world to offer Crisalix VR 4D consultations. Aesthetic surgical candidates interested in facial, body or breast aesthetic procedures can see their new look before surgery using Crisalix VR 4D technology, before actually going ahead with the procedure. Simply send an enquiry now for a consultation with Dr.Rappaport by email to [email protected] or telephone at 713-790-4500. A decision to modify one’s physical appearance should not be taken lightly. It is only normal for a patient to want to have a visual feel for what the final results might look like before committing to the procedure. Before Crisalix VR 4D simulations, patients were not provided with a satisfactory response to this universal concern. The only available option was to view before and after pictures of other patients or use sizers for breast augmentation – and, very recently, 3D. Crisalix has made it possible for every patient to have a personal Virtual Reality consultation by combining advanced medical research and state-of-the-art information technology in an effort to optimize the level of care and treatment they deserve. This breakthrough technology, now offered by Dr. Rappaport, increases patient education, understanding and interaction, to further optimize post-procedure satisfaction to a previously considered unattainable level. Dr. Rappaport is an American Board of Plastic Surgery certified surgeon practicing in the Texas Medical Center since 1980. Dr. Rappaport’s extensive training and continued involvement in resident education keep him on the leading edge of Plastic Surgery. Patients appreciate Dr. Rappaport’s thorough approach, taking as much time as they need to answer questions, devise and implement a personalized plan and give each patient an improved appearance that brings out her or his best features. Please see more about Dr. Rappaport and what is offered at Houston Center for Plastic Surgery at normanrappaportmd.com. Click here to request your consultation with Houston Center for Plastic Surgery! What are the main benefits of Crisalix? – 99% of Crisalix consultation patients were so satisfied that they would definitely recommend their surgeon to friends. – 86% of traditional consultation patients take months to years to gain confidence and commit to their desired procedure. Crisalix consultation patients saved considerable time gaining confidence for the procedure in a matter of days. Recommended by the technology and media leaders as well as Plastic Surgery societies around the world. Samsung, CNN, Elle, Cosmopolitan, ABC, etc as well as several plastic surgery societies recommend Crisalix for the significant progress its 3D simulation and, more recently, 4D VR technology brings to the entire medical community, along with its contribution to patient education and a more informed decision-making process. Patients using Crisalix have demonstrated much higher levels of satisfaction, improving the care and treatment of every patient seeking plastic surgery. Crisalix is the world's leading 3D & 4D imaging solution using mobile 3D sensor or 3 standard pictures for aesthetic procedures, which recreates the patient’s face or body in 3D and 4D VR to further enable accurate pre-visualizations of the final result. 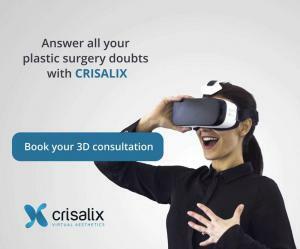 Crisalix brings together the latest advancements in surgical technology, VR, 3D and information technology supported by the world’s most recognized plastic surgeons.